Whenever I am traveling for work I try to find some local wildlife to photograph. I am currently in Vienna, Austria and yesterday morning I went for a short walk in the Stadtpark, a park in central Vienna that is not far from my hotel. In the small pond there I found mostly mallard ducks (Anas platyrhynchos), a species with which I am quite familiar. 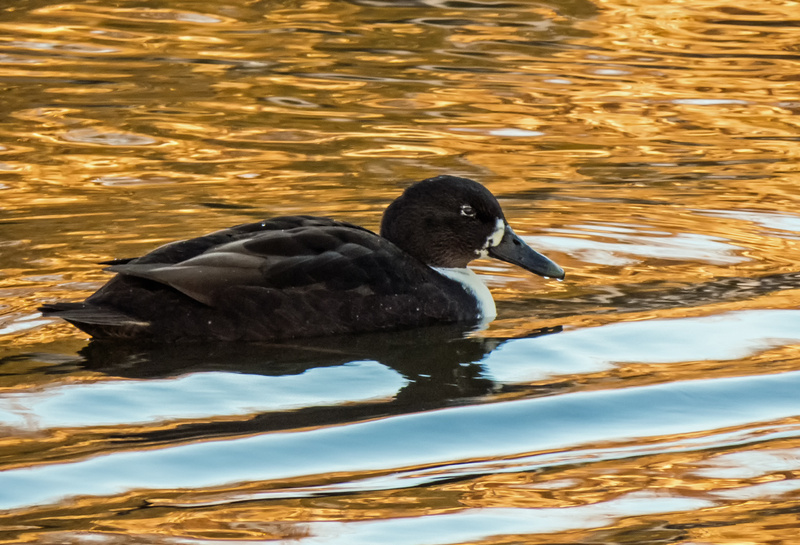 One duck, however, really stood out because it had such unusual markings. I focused my attention and my camera on this particular duck. Its shape looked to be similar to that of normal mallards and I wonder if this might be some kind of hybrid. I suppose that it could be another species altogether, though it did not look like any of the species in the photographic list I found on-line of the birds of Austria. 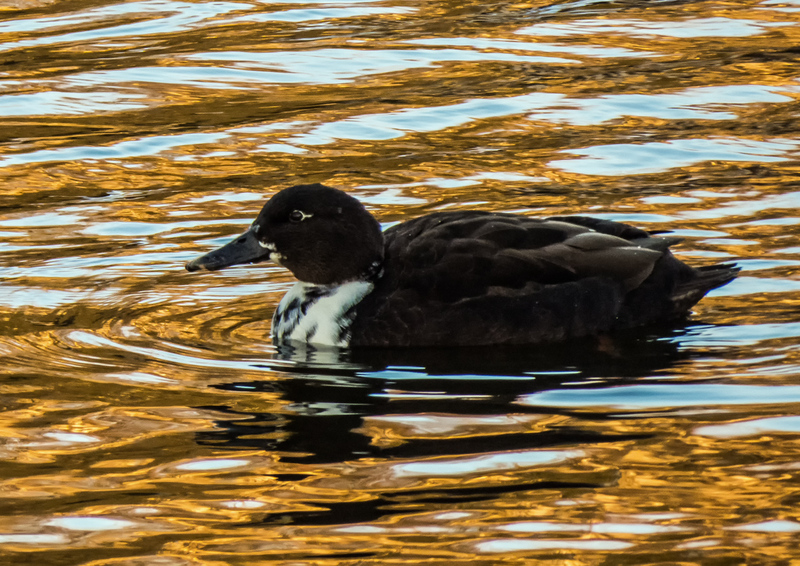 Whatever the case, this bird struck me as being a bit of an odd duck. Apart from the duck, the colours in the pond reflections are nice too. Is the golden colour from trees’ autumn foliage? Looks very nice with the blue which I assume indicates you’re enjoying beautiful weather in Vienna! Actually it is cold and windy, with occasional rain, here in Vienna. The golden color was caused by the early morning light, I think. Great pictures, the water looks shimmery. Thanks, Robert.The shimmer and the golden color came, I believe, from the rays of the early morning sun. I was able to get that effect only when I shot from a particular angle. Hi Mike, it’s what we call a Heinz (57 varieties) yes you are right a hybrid. Thanks for confirming my instinct. When I am in a foreign location I never quite know if what I see as anomalous is in fact anomalous for that location. Thanks for the info, Donna. The shape of the duck looks just like a mallard so my first instinct was that it was probably a hybrid. A decoy carver in Easton MD once told me that mallards are very horny: they will try to mate with anything (the example he gave was a tennis ball thrown into a flock of mallards: they will all try to mate with it.). on December 11, 2018 at 6:08 pm | Reply Molly D.
Odd duck in gorgeous water! Nice Mike! Like the colors!